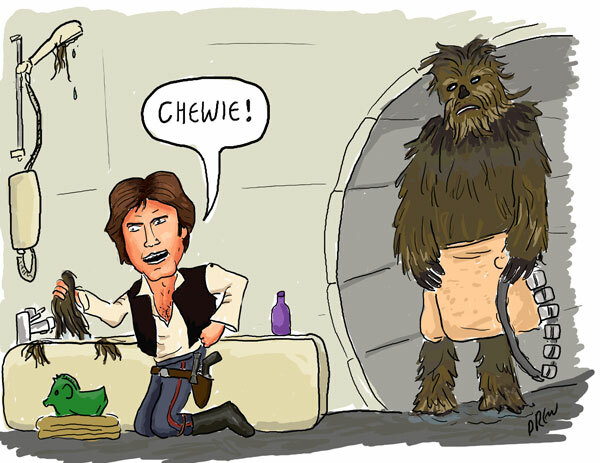 For this week's CCGB compedition themed 'HAIR' I thought I'd use one of the Rapunzel cartoons I drew earlier in the year but decided inside to rework one of the ideas with Han and Chewbacca. Did the Millenium Falcon have a bathroom it certainly didn't on the replica model that was the best Christmas present I had as a child. Also could Han and Solo use the same facilities given their different heights and if Yoda or an Ewok came onboard would they need a potty instead?